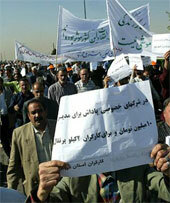 Workers at Iran's Haft Tapeh sugar factory have been engaged in a struggle since they first went on strike in October. The state responded with repression, arresting organizers, and the workers have been engaged in action in response. Here is the statement from the Workers Action Committee following the initial strike. Workers at the state-owned Haft Tapeh Sugar Cane Plantation and Industry Company have gone on strike demanding payment of several months' unpaid wages. They have gathered in front of the Governor's Office in Shush city, in Khuzestan province (southern Iran), and say that they will stay on strike until their demands are met. The workers say that due to the Iranian government's wrong policies they have had to endure many problems and have been forced to go on strike 16 times over the past two years. One of the workers' main problems has been the delay in getting their wages paid. After many empty promises from the government a number of the workers tried to bring their grievances to the attention of the local and regional authorities in Khuzestan province. Their representatives twice went to the Governor's Office in Shush city and met him. They had no success in getting the Governor's help towards finding a resolution. For two years they have got nowhere with the management or any government officials. The workers finally warned the authorities that if the government and the company's management did not act by 8am on Saturday 29 September then they would go on strike. They have now been on strike for seven days. They intend to stay out until the company's debts have been settled and the shadow of bankruptcy has been lifted - and they have all had their wages paid. To reduce debts the management have taken steps to sell the agricultural land of the company, its animal feed factory, spare parts and plan to make 2000 of the 5000 workers redundant (around 3000 are contract workers but many have 15 years' experience at Haft Tapeh). Haft Tapeh Sugar Cane is the only sugar cane factory in Iran and was built around 47 years ago. It currently has 850 billion rials ($91,275,125) of debts. The workers believe that since this $91 million is owed to state-owned institutions like the water, electricity and gas companies, as well as the tax and insurance authorities, then these debts can be written off. The workers say that a "sugar mafia" is operating in the country and has influenced the government into adopting the wrong policies regarding the sugar industry. As a result of the cut in customs duty on imported sugar from 140 to 4 per cent many sugar producing companies are facing bankruptcy. Both the private sector and the government are making big profits from importing sugar! In an open letter to the International Labour Organisation the workers of Haft Tapeh Sugar Cane say that they have no right to form a trade union and have had no official representative for a year. Some of the workers who have been following up these issues have been victimised and threatened with the sack. During the past few days four workers have been intimidated in this way. Iranian Workers' Solidarity Network and Workers' Action Committee (Iran) call on all trade unionists, labour activists as well as progressive organisations and individuals to support the struggle of the Haft Tapeh Sugar Cane workers for payment of their wages and trade union recognition.